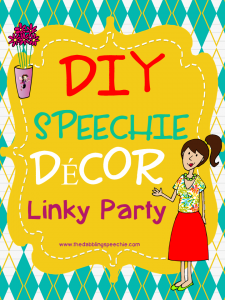 Joined up with TheDabblingSpeechie's Link-Up for Room Decor! 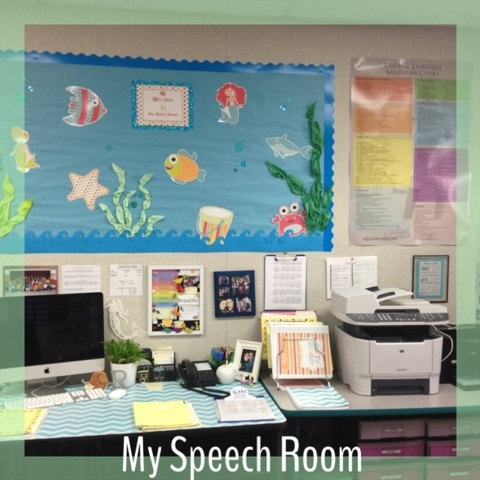 MY OCEAN THEMED SPEECH ROOM! Check it out!! I love decorating my Speech Room! Why? I spend the majority of my life in there people!!! haha. I want it to be a place I am happy to be in. I also really enjoy being crafty, coming up with decorating ideas and having fun with it! I am a little bit spoiled. 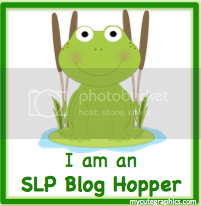 I share a portable with the Special Education teacher! We have three spaces in our portable: my office, a waiting/testing room (used to be the psych's office), and the special education teacher has about half the room for her class. Cut outs from Schoolgirl Style. I used glitter scrapbook paper for the bubbles. 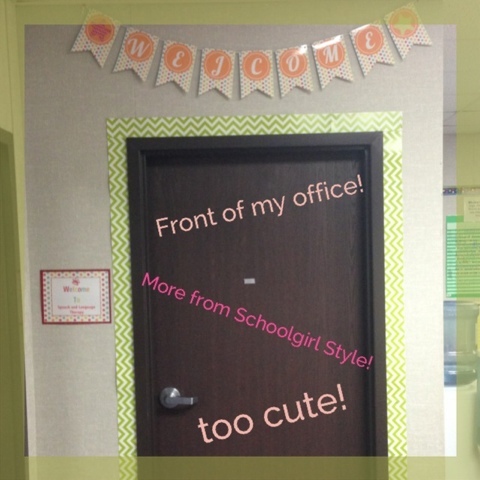 I used a border from LakeShore to line the bottom of my office. 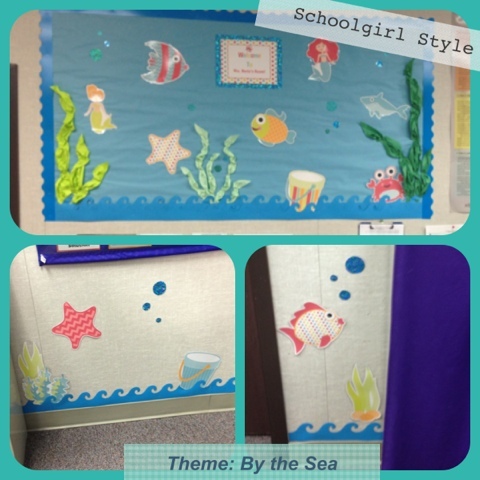 The seaweed is just crinkled up construction paper! Magnetic Pockets: Lakeshore. They come in packs of 4 for 12.99. I currently have things I need to finish up in them. 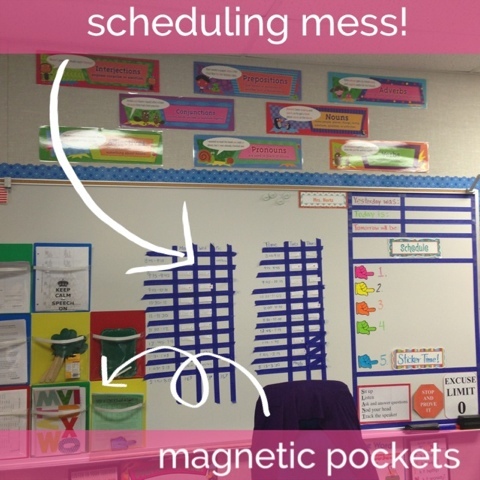 I plan on using them to put worksheets, cards or TpT materials for each group during the day. It's my way of preparing lesson plans! 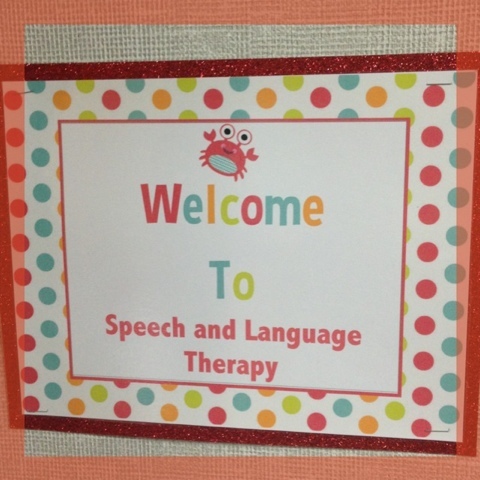 The blue tape is how I schedule my kiddos, but I just saw that Ms. Thrify SLP uses post-its! Why didn't I think of that? Notice my help box!? I write the date and the things we are going to do in speech that day. Just outside the frame is where I keep my objective binder! I used to have a bookshelf, but last year I moved this big cabinet in. It has been awesome! I can close the door and lock them if need be. Great to have when preschoolers are around! Green paper shredder. 2 rolling storage bins with paper in them to make them look less messy!! 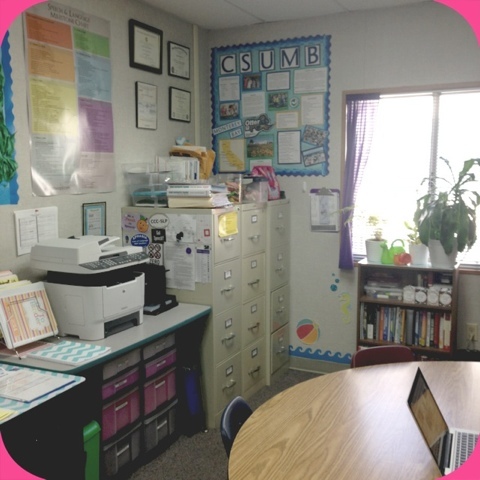 3 filing cabinets: 1 student IEP files, 2 important papers, test protocols, speech folders, my stuff and 3 is TPT and other materials! Bookshelf with all my graduate school books. Common Core Cans are there too! Can't wait to use them! I also have a college bulletin board, I did not attend CSUMB (my colleges were taken already!) but it has a cute Otter Mascot which went well with my ocean theme. Bought new containers from WalMart for 97 cents! 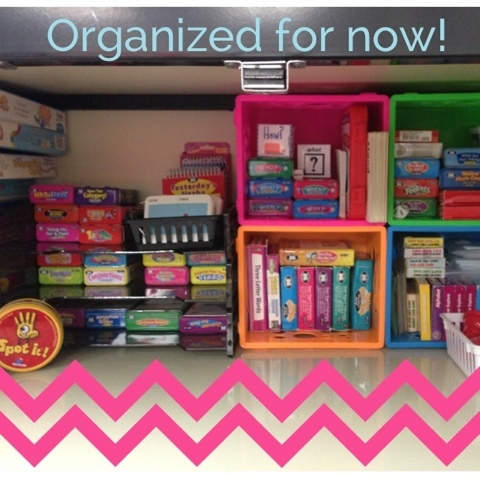 I used them to organize all my cards! 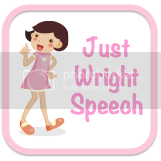 They are now organized by area: WH questions, Pragmatics, Vocabulary, grammar etc. More of my room! The orange bulletin board is where I put my kids pictures for the year. 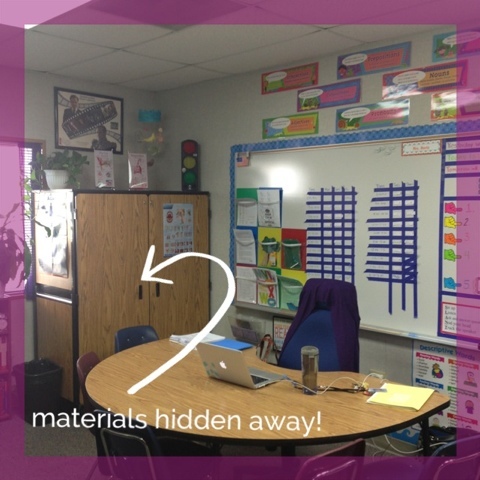 The purple curtain is hiding tests, books and workbooks! I sewed it myself and stuck it on with velcro! I love mermaids and snails! They are everywhere in my office if you look hard enough! 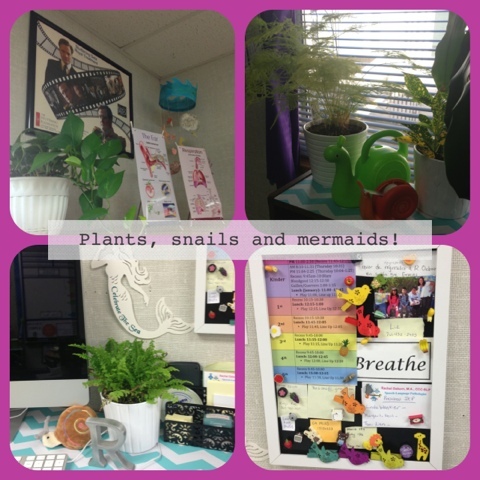 I am also a bit of a gardener and my office would not be complete without my plants! I am lucky enough to have a window in my room! Hooray! 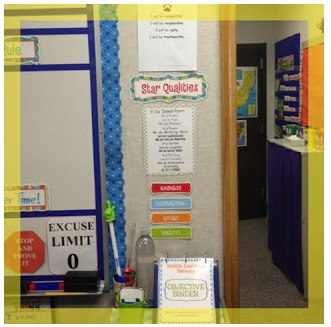 The color coded thing is the schedule for lunch, recess, blocked time and other times for each grade level! School Rules at the top. Speech Room New's "In This Speech Room" Poster! Down at the bottom is my objective binder. 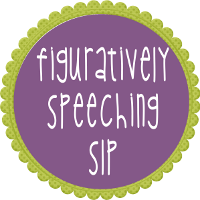 The green tub will be for Kagan strategies and the bottle...is a secret post coming soon. Really cute!! 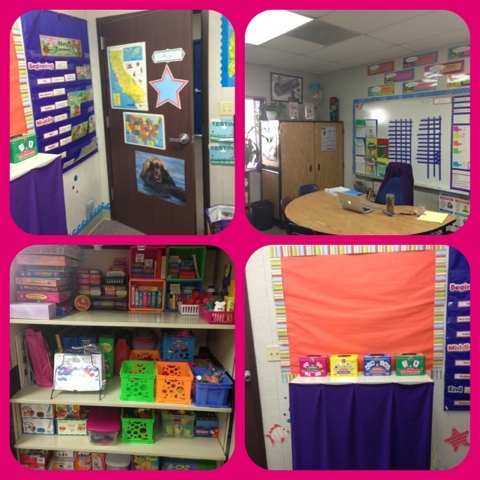 We are on our 3rd week of school and I'm still working to get all of our decor up! I finally started seeing kids today! :) It was crazy! I try to get my bulletin boards up at the end of the school year before we leave for summer....didn't happen this year! ack! So I feel behind! I like how you have plants in your room! I wish I had windows to bring some plants to school. Thanks for linking up. Time to put those magnetic pockets on my wishlist to purchase. I have purposely bought plants that require very little light! Our school has been broken into many times, and when I leave I have to close the blinds! 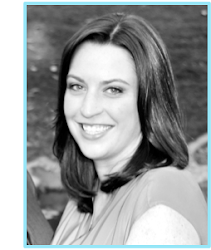 I finally added your image! Forgot! oops!! Your room looks very tidy! Thank you! It is! The only mess is on top of the filing cabinets right now! I also have a testing room with all my miscellaneous items which is a bit more cluttered but it is all tucked away in one of the big cabinets like you see here. Wow! I really love how you have decorated your room! I love the organization with your therapy materials. I need to work on that :) Thanks for the ideas. Thank you! It will only stay organized for a bit...then I start seeing groups and it gets crazy!